Sometimes a seal hunter has to wait a long time at the seal hole for the seal to surface… And he must be extremely quiet in order for a seal to come to that particular hole. Mind you, the seals have a number of seal holes. They don’t use just one. Hunters waiting to harpoon seals at their breathing holes stood on small stools to keep their feet from being chilled by the ice. 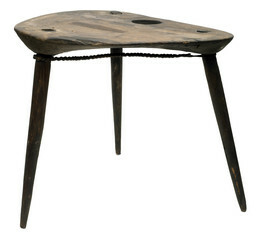 This spruce stool is thin and light, with leather thongs to brace the legs. The hole in the top was for carrying and hanging. Kenneth Toovak: Uvvanua natchiqsiunnakkiuvva amii. Natchiqsiunnaq uvva. Ron Brower, Sr.: This is a sealing harpoon. Kenneth Toovak: Yes, for when there’s a seal coming up to breathe. Ron Brower, Sr.: And once you harpoon the seal, you can pull it up. This braided sinew [line] is pretty strong. And looking at the harpoon point, that’s for catching seals. This [ice pick] end is for chopping the ice around the seal hole. So this would also have the little stand that goes with it, when they’re seal hunting, the little stool. 1. Murdoch, Ethnological Results of the Point Barrow Expedition, 233–35. 2. Ray, “Ethnographic Sketch of the Natives,” 40. 3. Murdoch, Ethnological Results of the Point Barrow Expedition, 234–35.